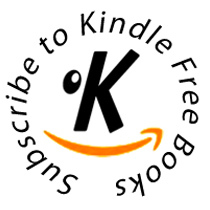 Subscribe to Kindle free Books and get an ebook review and download to your email every day! A new book is reviewed every day with a download link directly to Amazon. Kindle free books will not sell or pass on your email to anyone else. Just fill in the form below and get started - Join now. All the books in the right hand column can be downloaded through Amazon whispernet directly to your Kindle or Kindle app software on your device. The first 5 books in the right hand column are the most popular books this week. The list is updated daily and will feature whatever subscribers to the site have voted their most popular books. Kindle free books aims to promote both new and established authors who publish their books in a kindle freindly format. No preference is given to paid books as the popularity of the books is shown by kindle free books readers votes. @kindlefreebook twitter updates are also shown. These are also updated daily and feature many free books that are available for a limited time or until the author revises the price. It is a good idea to visit the site often as these free books can sometimes be limited to a twenty four hour period. Thanks for your support of this site - please subscribe.